Barbara and I spent December 6-11 in Hawaii on Maui. We went there for the wedding of one of my great-nephews. Obviously, the wedding didn’t take 6 days. We spent most of our free time birding. My main goal was to see the 6 endemic Honeycreepers that can be found on Maui. We succeeded in locating 4 of them at the campground at Hosmer’s Grove, near Mount Haleakala. 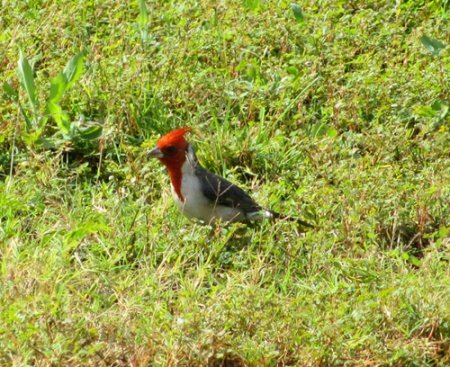 Seen were the Hawaii Amikihi, Maui Alauhio (Maui Creeper), I’iwi, and Apapane. All of these were present in good numbers near the campground. Especially numerous were the I’iwis and the Apapanes, both lovely red and blacks. One day we hiked the 2 and a half mile round trip boardwalk on the Waikomoi Preserve, a Nature Conservancy property near Hosmer’s Grove. The primary reason for taking this somewhat strenuous hike was to find the rare endemic honecreepers, the Maui Parrotbill and the Crested Honeycreeper (Akopekohe). We were not able to see either, but our guide recognized the frog-like calls of the Honeycreepers. 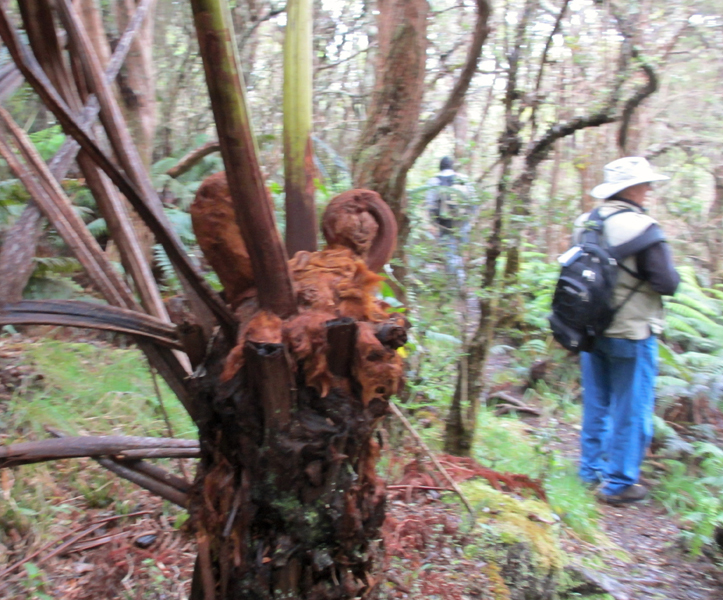 The unique forest, with its numerous species of ferns, was spectacular. Especially interesting was the Fiddlehead Fern. The other endemic species that we were able to locate was the Hawaiian Coot. We also found large numbers of the endemic subspecies of Black-necked Stilt. We saw what might have been a pair of Hawaiian Ducks (Koloas), but it was not clear whether they were Hawaiian Ducks of Mallard females or a hybrid of some sort. Cinnamon Munias or Mannikins (20), Spotted Doves (several), and African Silverbills (4). Present in large numbers were Pacific Golden Plovers, Cattle Egrets, Common Mynas, House Sparrows and House Finches. 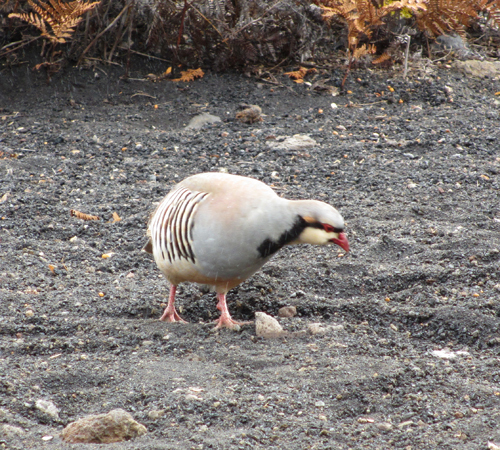 We also saw a few Mallards, Skylarks, Rock Doves, and Northern Mockingbirds (2), and Chukars. 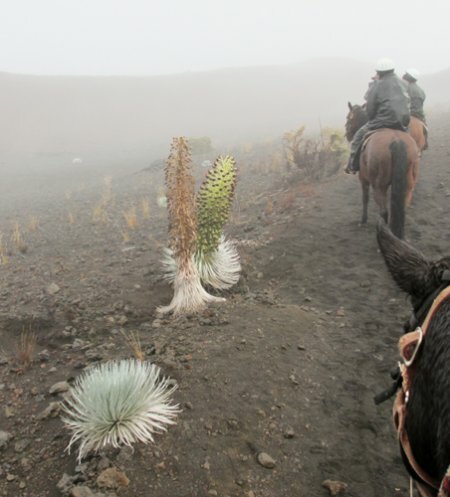 A late-blooming Silversword was near the trail on Barbara’s horseback excursion in the Haleakala crater). We saw what we thought might be a Nene juvenile or hybrid at the Kealea Ponds, but it seems that it may have been a black brant or some hybrid of the Nene. Fortunately, I had seen Nenes on a trip to Maui some 25 years ago. We did not see any on this trip. Among the notable changes from 25 years ago was the absence now of pineapple cultivation (we saw none) and reduction in the sugar cane acreage. The lore we absorbed was that pineapple production is too costly relative to the cost of production in other areas of the world, and that the many years of sugar cane production has ruined the soil so that it has become unproductive. 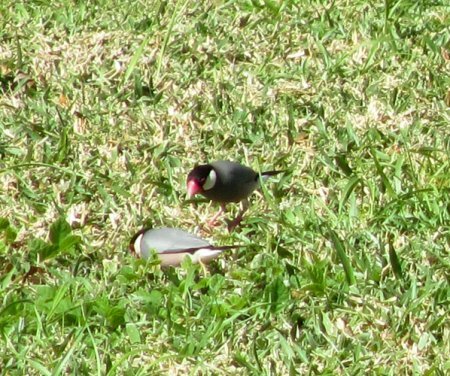 Among the more likely Maui winter residents that we missed, in addition to the 2 endemic Honeycreepers mentioned above, were the Hawaiin Petrel, Nutmeg Mannikin, Orange-cheeked Waxbill, Red-billed Leothrix and Japanese Bush Warbler. We did not spend much time on “Ocean Watch”, but we did not see a single marine species during the week we were on Maui. My field guide was a second-hand volume of “Hawaii’s Birds” published by the Hawaii Audubon Society (6th Edition, 2005). It was very useful.